Bay Roan Stables is a stable north of the city of Bravil. 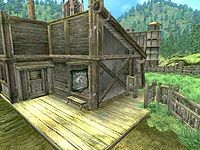 It is one of two places where you may purchase a Bay Horse, the other being the Grateful Pass Stables at Skingrad. A handbill advertising the stables is listed in the Construction Set, but cannot be found in-game. It would have read: "Bay Roan Stables has what you need. Horses, horse, horses. Don't be content to walk. Ride with style on a Bay horse from Bay Roan Stables." Esta página foi modificada pela última vez à(s) 17h04min de 9 de junho de 2013.